China is not necessarily the first country that comes to mind when someone says: sustainable fashion. Known for crippling pollution, overcrowding, and a toxic water supply, China is far from an ecological paradise. However, recent outcry over work conditions and air quality has made the Chinese government aware of the urgency of developing a new status quo, especially in manufacturing and fashion. China is reinventing itself. As the population transitions to the middle class, consumers are demanding products that are not only affordable, but also high-quality and sustainable. One industry where this shift is particularly notable is fashion. China has long been a producer of cheap apparel and goods, but as fast fashion has come under heat for its harmful practices, China has taken note. With consumers and the government paying attention to the environmental impact of fashion, China has become not only one of the biggest producers of sustainable fashion, but also one of the biggest consumers. Here’s why you should be paying attention to this historic shift. 1. Fashion is the second-most polluting industry in the world, and most of it is produced in China. Second to oil, fashion is the most polluting industry in the world. 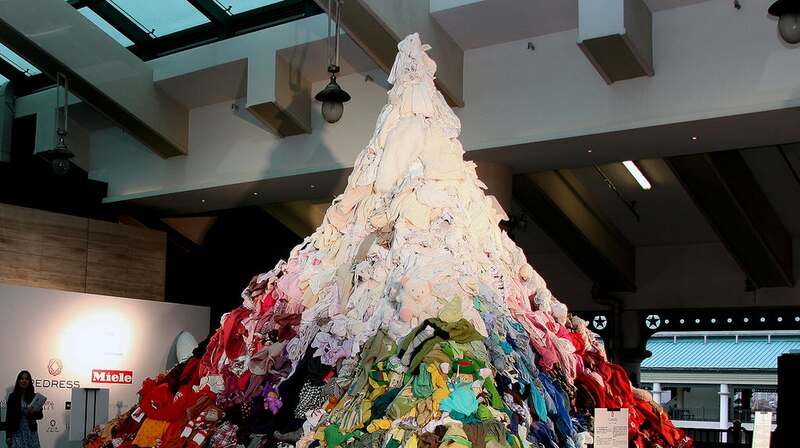 China alone produces 70,000 tons of fashion waste daily, which represents 53% of the world total. The production of polyester is particularly harmful, since it uses petroleum and is not biodegradable. To combat the mass production of polyester, Chinese brand Icicle is producing professional apparel out of natural fibers like wool, silk, linen, and soy. Icicle has caught on quickly and now has over 200 stores, 2000 employees, and reported revenues of RMB$1.6M (USD$254M) per year. This success is a sign that Chinese consumers are becoming more aware of the environmental impact of the fashion industry. 2. Chinese consumers are intimately aware of the impact of pollution. 16 of the world’s 20 most polluted cities are in China. People live daily in smothering air pollution and are aware of the toxic groundwater. Unlike other countries, where environmental pollution can be hidden away and ignored, China’s contamination problem is acute. In a country where 60% of water sources are considered unfit for human contact, 10% of all industrial wastewater emissions come directly from the fashion industry, with 72 of the toxic chemicals in the water coming from textile dyeing. Some locals even say you can tell what color will be in fashion next season based on the color of the rivers. It is impossible to hide the impact of the rampant fast fashion industry on China, and regular consumers are waking up to the fact that the status quo needs to change. 3. The Chinese government is starting to care about the environment. In 2016, the Chinese government released their 13th five-year plan, which strengthened their commitment to improving their environmental impact. By 2020, they plan to produce 4.5 tons of recycled textile to fight the environmental impact of textile production. President Xi Jinping has also been a vocal supporter of the Paris Climate Agreement. As China shifts to more sustainable manufacturing practices, fashion has been at the forefront of the movement. 4. Chinese entrepreneurs are revolutionizing the green fashion industry. Have you heard of Shaway Yeh, Redress, Green Code, Ffixxed Studios, Icicle, or Reclothing Bank? These influencers and brands are pushing for sustainable manufacturing practices, upcycled clothing, and low-waste factories. Last year’s Shanghai Fashion week even included a sustainable fashion event called Green Code that is bringing visibility to the new industry. While several companies operate sustainable factories in China and sell to a European audience, these companies are focused on selling to the Chinese consumer. To date, most of the clothing is too expensive to attract mainstream customers, but the growing middle class is beginning to recognize homegrown ethical fashion options. 5. The Chinese middle class is growing, and they demanding sustainable fashion alternatives. China has come to represent an enormous, almost inexhaustible consumer base for those who know how to reach it. While the middle class currently represents just 8% of the population, it is estimated that it will make up 31% of the population by 2030. In a survey of 10,000 Chinese consumers in 10 cities, it was revealed that 70% of Chinese consumers are aware that personal consumption has a direct impact on the environment. 62% of upper middle class Chinese people are already deliberately seeking out sustainable fashion alternatives. There is still a large, mostly untapped opportunity to produce green fashion products for this consumer base, and it keeps growing yearly. 6. China is becoming known for high-quality manufacturing at affordable prices. International corporations have often gotten a bad reputation for exploiting Chinese labor laws to produce cheap products. However, as visibility and awareness about sweatshops has increased, consumers have pushed back. New brands like Les Lunes, Everlane, Grana, and Ellie Kai are working to change the perception that Chinese-made products must be cheap and exploitative. These companies promote high-quality manufacturing in China by providing clean and healthy workspaces to skilled artisans and well-paid factory workers. Currently, these products are destined for an American and European market, but as the Chinese middle class grows, China will be an increasingly important market to target. Sustainable fashion is a global phenomenon. While far from becoming the norm, ethical fashion companies across the globe are pushing for a less toxic industry standard. With the world’s largest consumer base, and longtime manufacturing hub, catching on, the sustainable fashion industry in China is ready to take off.